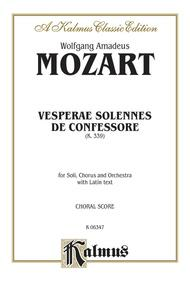 Vesperae solennes de Confessore, K. 339 (SATB with SATB Soli (Orch.) (Latin Language Edition)). Composed by Wolfgang Amadeus Mozart (1756-1791). Choir Sacred. For Orch. (SATB choir). Choral (Sacred); Choral Worship Cantata; Larger Works; Masterworks; Worship Resources. Kalmus Edition. Classical; Masterwork; Sacred. Book. 68 pages. Published by Kalmus Classic Edition (AP.K06347).ISBN 0769243746. Classical; Masterwork; Sacred.These Vespers, or Evening Prayers, K. 339, were written by Mozart in 1780, presumably in honor of St. Rupert and/or St. Virgil, patron saints of the Salzburg, Austria region. This score is 7 ½ by 10 inches in size, 88 pages. Originally published by Belwin Mills, this choral score, in Latin, contains the voice parts on separate lines over a piano reduction of the orchestral score. Includes: Dixit Dominus * Confitebor * Beatus Vir * Laudate Pueri * Laudate Dominum * Magnificat.